SKU: roundtag6 Category: Tags - bags, animals, key-rings etc. Name tag perfect for lunch bags, pets, bags etc. Need a name tag for the lunch bag, the school bag, the suitcase, the dog and whatever else you can find you need a name tag for – you should be able to find one of here. 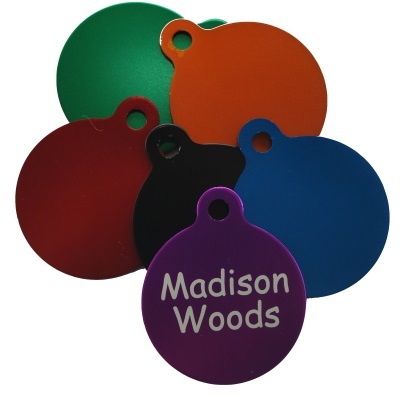 The large GI Tag is perfect for as a bag tag, an ID-tag with the child’s name and your mobile on the bag is a perfect necklace when you are out and about – or maybe just a funky name tag for your work do – or a funky name necklace for the kids. 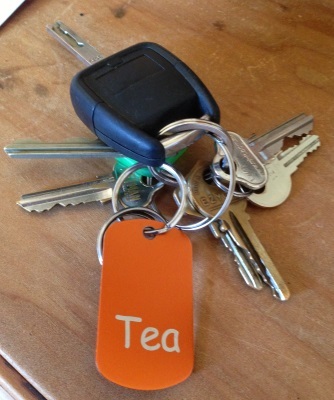 – Can also get it with a ring so perfect as a key-ring with any name/text on.